Mark wants to live in a round house some day, and I have to admit that the idea has merit every time I go visit Joey's yurt. The circles and lines in the yurt always capture my interest and I end up taking photos that could almost be abstract, like the one on the left. 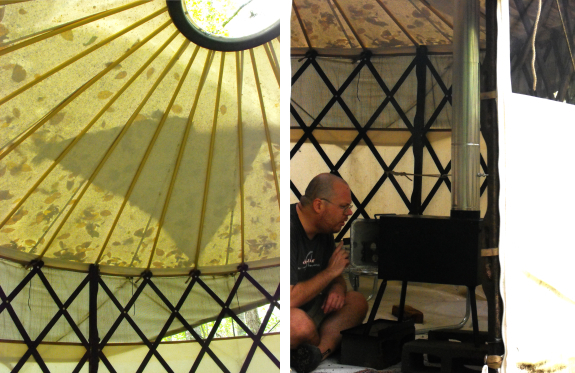 Joey considered taking the yurt down for the winter, but instead he bought a Two Dog Stove, specially designed for safe use in tents. The stove is so small that Joey was able to carry it in by himself soon after our most recent flood. Setup took mere minutes with the ultra-cool telescoping stove pipe --- no need to laboriously fit pieces together; just grab both ends and puuuullll.... I'm curious to see how well the stove keeps Joey warm during his wintry visits to the farm.